Soup is an international crowdfunding phenomenon that brings communities together to raise small-scale investment to kick-start new businesses or ideas. The concept is simple – come along, pay £3.50 for a bowl of soup, and listen to three or four investment-hungry businesses pitch their idea. Pitchers each have the floor for up to four minutes, and must rely on their passion and speaking abilities alone to win over the audience – no gadgets, give-aways or PowerPoint. The audience can then ask a maximum of four questions to try to establish which business is most worthy of investment. With the presentations over, soup is served. Now you will have time to network with your fellow soup-funders and mull over the ideas before choosing your favourite. To vote, you’ll just place your empty bowl at the table of the business you feel is most worthy of your investment. The winning business gets to take home all the money taken at the door and use it to fund their plans, with the promise they will come back three months later to report on their progress. 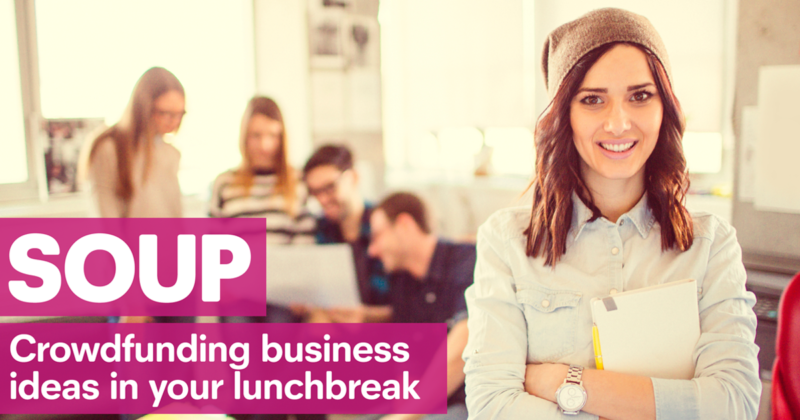 Join us for a warming bowl of soup, hear from some exciting new business ventures, and play your part in investing in the businesses of tomorrow. Cost: £3.50 – this covers entrance to the event, a bowl of vegetarian soup, and one vote. For more information and to book your place at the first Plymouth University SOUP click here.